An organisation which aims to empower members to achieve their ambitions through small and supportive Lean In "Circles". It is an initiative of Sheryl Sandberg and the Dave Goldberg Family Foundation. Small groups—typically of 8 to 12 members—that meet regularly to learn and grow together, support each other, and acquire new skills. They talk openly about their ambitions and encourage each other to take on new challenges. Who is Lean In for? Lean In is inclusive for everyone: men and women, as both are needed to address topics of gender equality. If you have been feeling disconnected on campus or want a small trustworthy group to support you through your time at LBS, joining a Circle is a great place to start! Fun Fact: 900 corporate partners (Amazon, PwC, Coca Cola, Google, JP Morgan, etc.) actively participate in the Lean In initiative and run successful Circles - so there's lots of opportunities to continue after graduation! How will the London Business School Lean In Network work? 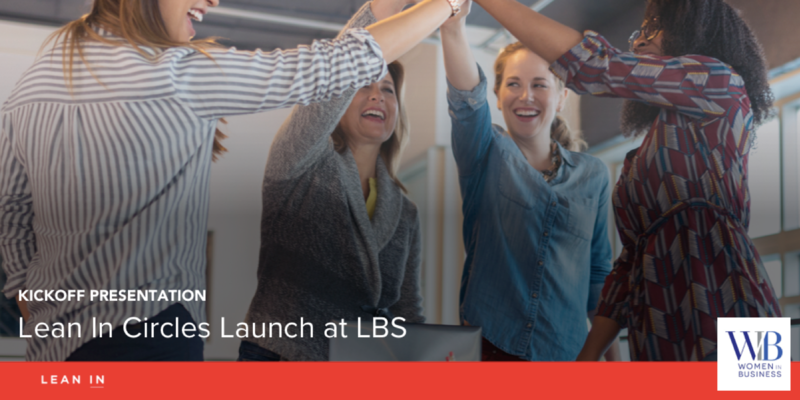 The LBS Lean In Network is a platform which connects all Circles started within the LBS community. Anyone at LBS can choose to join a Circle within the network, or you are also free to start your own Circle and add it to the LBS Network. What is our goal as the Lean In WIB committee? We look forward to seeing you on February 13! Emma Roberts is the Program Lead for Lean In Europe and the first International employee of the Sheryl Sandberg and Dave Goldberg Family Foundation. Founded by Facebook COO Sheryl Sandberg, LeanIn.Org is a non-profit organisation that exists to empower women to achieve their ambitions. LeanIn.Org offers inspiration and support through an online community, free education materials, and Lean In Circles, small peer groups who meet regularly to share and learn together. Emma is responsible for the growth of Lean In Programs and Partnerships in Europe which includes working closely with companies to run programs that advance opportunities for women–and help organisations build more equal workplaces.